Miracle on 34th Street! 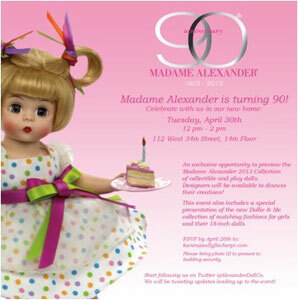 The Madame Alexander Doll Company threw itself a birthday bash on April 30. Madame Beatrice Alexander began her life as Bertha, but changed her first name to the more melodious moniker. 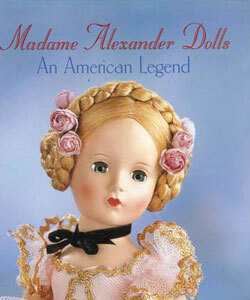 Beatrice Alexander set out to establish a doll factory in an age where very few women operated their own businesses. She was a woman in a man’s land. Beatrice strikes a pose with two of her creations. She shows off both her femininity and her focus on excellence as she inspects this pair. 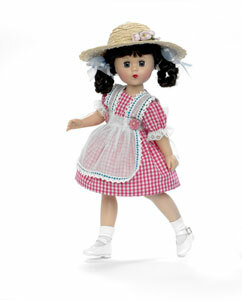 Madame Alexander is made into a doll for the company’s 90th anniversary. 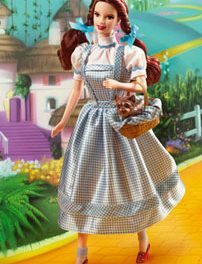 The doll shows off her personal style and demeanor. 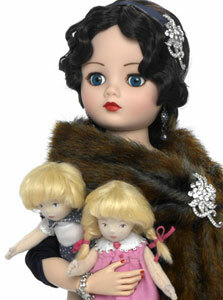 The 90th Anniversary doll of Madame Alexander pays tribute to the famous photo that shows her inspecting her dolls. In honor of the 90th anniversary, “Cissette” will be debuting in July. The always darling, perennially popular “Wendy” is a vision in pink as she celebrates her company’s 90th milestone. Pink was Madame Alexander’s favorite color for suits and scarves. The 75th anniversary of Madame Alexander’s doll company was chronicled in this book, which I was fortunate enough to have written. 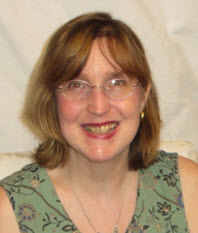 Her work with interpreting the coronation of Queen Elizabeth II is the stuff of legends. She was tough and critical, making sure only the best carried her company’s name. Here she is overseeing the ladies in waiting. 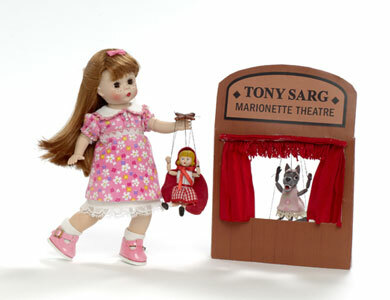 Part of the 2013 line that commemorates the 90th anniversary is this rendering of “Wendy” with the Tony Sarg marionettes. 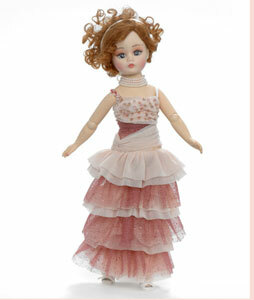 “McGuffey Ana” joins the dolls who have assembled to make the 2013 array an extra special one. After hearing mounds of bad news over the past few weeks, it’s gratifying when a piece of cheerful information flits over the transom or, in more modern terms, arrives in one’s e-mail in-box. Such was the case when I received notification of Madame Alexander’s 90th anniversary celebration. No, the esteemed Beatrice Alexander isn’t turning 90—the company’s founder passed away in 1990, at age 95. If she were still alive today, she’d be looking at 118 candles on her birthday cake. It’s Madame Alexander’s baby—her company, her legacy—that has achieved the 90th-year milestone. And it’s quite an achievement, indeed. Many businesses open and then quickly shutter their doors. 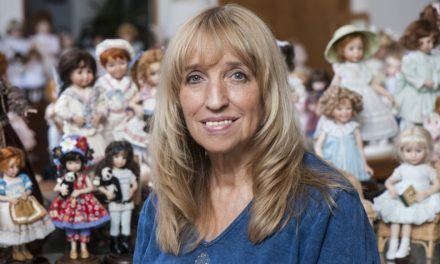 The Alexander Doll Company, thriving and surviving through economic peaks and valleys, is a testament to American ingenuity and re-invention. Like Jay Gatsby—the millionaire literary protagonist who cloaked himself in myths and tales of grandeur—Beatrice Alexander did likewise. 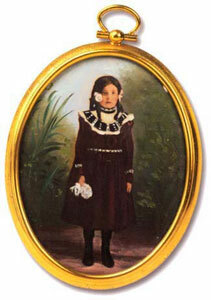 In fact her real birth name wasn’t Beatrice—it was Bertha. And she wasn’t a madame or any other form of royalty. She was simply a bright, driven, focused, and talented aspiring entrepreneur from Brooklyn. 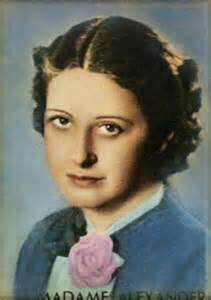 If her life story were going to be cast, she’d be more likely played by Barbra Streisand than Maggie Smith. Despite positioning herself as a titled, regal woman—a dweller of Downton Abbey, if you will—Beatrice Alexander was feisty, gutsy, and hardworking. She didn’t inherit her wealth and social standing; she fought and scrabbled for every penny and every gala invitation. 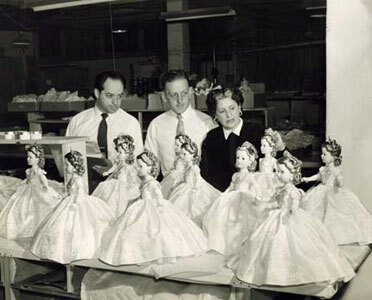 Over the years, the Alexander Doll Company has ceased being a family-owned enterprise, but the company continues to honor Madame’s vision and versatility. 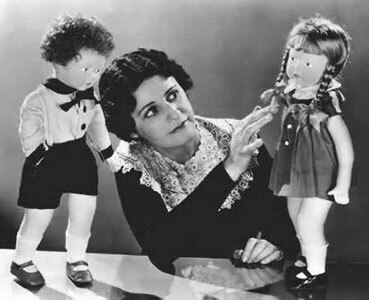 A genius at licensing and merchandising, Beatrice’s keen eye for “the next best thing” led her company to greatness in turning icons of the stage and screen into play dolls. She even indulged her passion for pomp and circumstance by giving Queen Elizabeth II’s coronation the divine doll treatment. When the company was turning 75 years old—I can’t believe this was 15 years ago—I had the grand privilege of writing the definitive book on Alexander’s life and times. It was an honor to immerse myself in her correspondence, business calendars, and family photos. I had the chance to meet members of her family and talk on the phone with key members of her staff. It was a heady and uplifting experience. Learning about Beatrice Alexander—her flaws and her strength, her foibles and her victories—I realized that she was a woman who did not let other people’s expectations and rejections stand in her way. She never allowed another person’s definition of who she was to determine what she would achieve or where she would arrive in life. Whether it was a Manhattan townhouse or a Palm Beach estate, she adored the life of luxury. She enjoyed indulging herself and didn’t deprive herself of material comforts. And in her Harlem factory, where all her original dolls were made in America, she manufactured more than just playthings. She manufactured an American Legend. Today, the company’s offices have moved downtown. Their real estate has changed hands, and their corporate board has bid farewell to some folks and have welcomed others into key, strategic positions. Happy 90th Anniversary to her company and to the fashionable and exquisite work that they are doing today. I hope their 2013 line is a helluva good one! NextDragon Heart: “Game of Thrones” sets sci-fi geeks’ (and their moms’) imaginations afire! Lady Luck: RuPaul may be a walking-talking doll, but what happened to the fashion figure?